When we at Rumspeed began redesign work for the Allegan Area Arts Council, we knew that the web site had to be sharp. It not only had to look good, but the features we added needed to be seamless. The AAAC's previous site had a simple list of members, most of them not linking to any further details. We had to add personality to the site, specifically the artist member directory and unique profile pages. To showcase their members, Rumspeed applied its Core Member Directory System to AAAC's web site and added custom fields to provide a solution that fit its needs. An events calendar is integrated into the site to display photos and details of their ongoing events and promote local artists. The goal was to build an application that promotes members and their artwork. These tools have improved member acquisition and member retention. With many events and ongoing classes to showcase, we added an events calendar to organize it all. The events are displayed in different views, including month, list, map and photo formats. This provides a dynamic view of events and helps promote local artists. With the addition of the Become a Member form, the AAAC is able to accept payments and enroll new members anytime. This has helped grow the member base. The form is dynamic and changes the fields when the membership type is selected. After the initial design was complete, we added a "web service" to the site that enabled another web site to pull in selective member data for a daily member showcase. 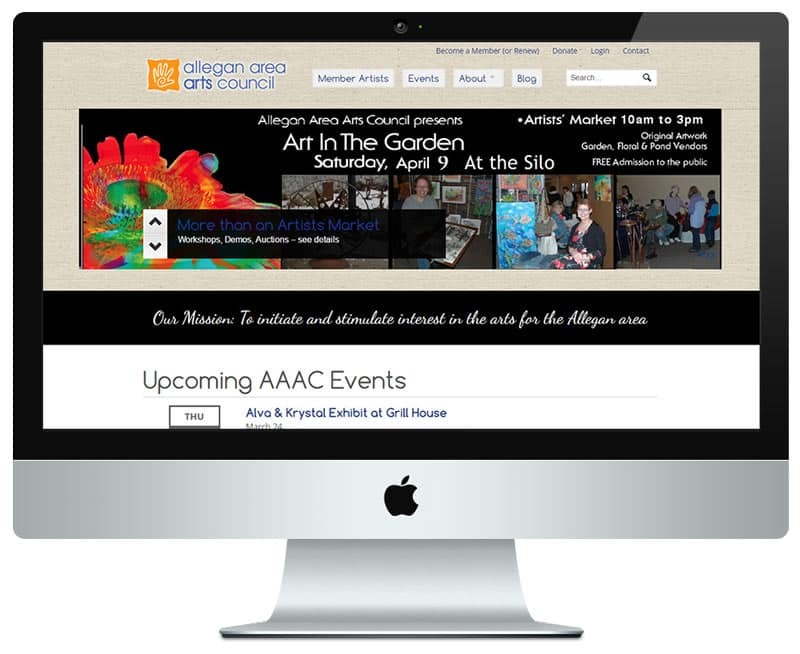 You can see the Artist Member Directory records displaying on the homepage of the Positively Allegan site in the Community Connections section. Another missing piece from its previous site was a web log, which could highlight artist stories and update events. We added a blog to the web site that displays wide, eye-catching images that help tell the story and showcase the content. The more recent entries are automatically pulled into the homepage to show that the site is active. After the site was launched, we added a great little feature called Discover Artwork. Visiting this page will pull one image from each member's gallery and display it on a page. It's a great way to see art from local artists and discover what AAAC members are known for. A form was added to accept public donations to increase support from the community.